Just the other day my girlfriend and I got talking about planning for our future. As much as I’d love to only live in the present, I realize it’s just not practical. I don’t want to be carefully watching every nickel when I’m retired just because I didn’t plan ahead. My retirement savings won’t just magically appear without taking the necessary steps now. Perhaps I take things a bit too far with the amount of time I’ve put into my blog in the last while. My girlfriend seems to think so anyway. I have my reasons though. Sometimes you have to take that kind of approach when you’re in a unstable industry. I’ve come to the realization that to get where I want to be, I should be saving more aggressively. I also need to be setting myself up for the possibility of being without a job at some point down the road. It seems pessimistic, but it is also being realistic. People really should take the time to think about their finances. With their current path, will they actually achieve their goals? Are they relying on some future luck and assuming things will work out? It takes a lot of money to comfortably retire and you should have far more than you need. You just don’t know how long you’ll live and what kind of expenses will come up. The other factor that affects my viewpoint is that I feel that I wasted too much money in my 20s. Since I didn’t save enough money then, I have to play catch up now. If things work out well, I’ll be able to save considerably more now and develop a passive income stream for the future. I also feel I have wasted a lot of money and I was not really thinking about finances and the future. I was just living life. I do not want to be working when I am supposed to be retired. That’s why I decided to start my journey to financial freedom. It seems to be a pretty common trend for people to make those kinds of mistakes when they are young only to get really focused later. Good luck with your journey to financial freedom Demaish. I need to start focusing more on the future as well. You never know what may happen! That is a good idea, but with the amount of side income you’re raking in, I’m sure you’ll be fine. I try to always think things with the future in mind. Life can change overnight but if you have a main path you should be just fine. I’ve definitely experienced having life changed overnight. More than once I’ve been relying on website income to get by only for it to suddenly blow up in my face. So this time around I’ll keep concurrently working a full time job just in case. I wasted a lot of money when I was younger. Luckily now I know better and am planning for my future. I lost a lot of valuable time! That’s exactly how I feel. I need to make up for that lost time with a more aggressive approach now. That must be pretty frustrating when you go in expecting that debt to be for building your career. Unfortunately things don’t always turn out that way. I think it’s definitely smart to think about the future at a young age. You don’t want to regret not saving for your retirement when you’re in your 40s because it’s just that much harder when you’re older. Not only is it much harder to start in your 40s but I couldn’t imagine that pressure. The possibility of not having enough for retirement would be daunting. 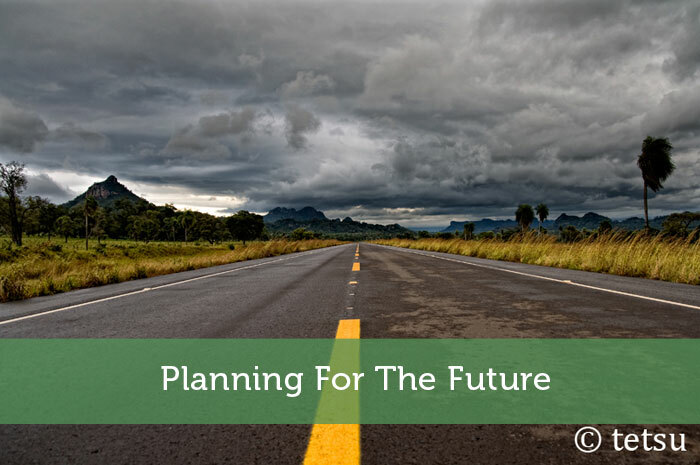 Planning for the future is really high on our priority list, as you probably know! It’s good to think about it way before you actually need to stop working or else you could be in for a surprise! That would be a pretty nasty surprise. Suddenly you’d find yourself forced to work well past the normal retirement age and live a much less comfortable life than you might’ve hoped for.